Here at Limelight Tiles & Ceramics, we are altering the way people view tiles with our ability to manufacture custom ceramic tiles. Typically, you have to purchase tiles how you see it, but when you turn to Limelight Tiles & Ceramics, we will walk you through our design and customization process. We put our clients first by understanding what type of design they are looking to showcase in their home or business. 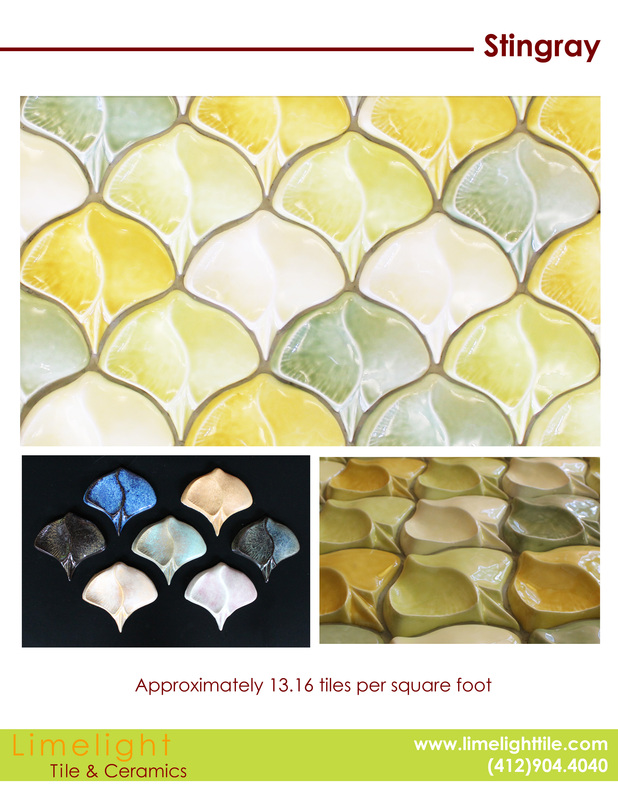 Once we have selected a design, we will help each client choose the ideal color or colors to complete the tile pattern. The Stingray pattern is ideal for grabbing people’s attention right away. This particular design has approximately 13.16 tiles per square foot. Expand your creativity when choosing from our current color selection of more than 300 colors. Dial (412) 904-4040 if you have questions about the Stingray design or other restaurant tile options. We will happily discuss our custom ceramic tiles with you.